The original US CD-ROM Development Contract has been edited by an attorney in Canada to conform to Canadian law. The CD-ROM development contract is for use when creating CD-ROM, DVD or other mass produced presentations. Many web developers are now putting their clients PowerPoint, Web Site, Flash, Director and other Slideshow presentations on marketing CD-ROM's. This CD-ROM Development Contract (Canada) is included in editable Word format that can be customized in Word or by using the included Wizard software. 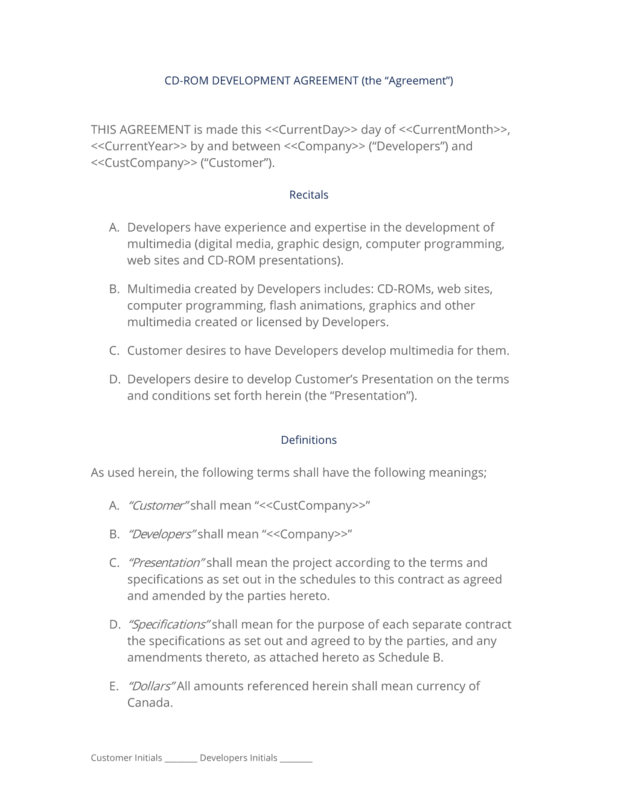 THIS AGREEMENT is made this Current Day day of Current Month, Current Year by and between Company Name ("Developers") and Company Name ("Customer"). Developers have experience and expertise in the development of multimedia (digital media, graphic design, computer programming, web sites and CD-ROM presentations). Multimedia created by Developers includes: CD-ROMs, web sites, computer programming, flash animations, graphics and other multimedia created or licensed by Developers. Customer desires to have Developers develop multimedia for them. Developers desire to develop Customer's Presentation on the terms and conditions set forth herein (the "Presentation"). As used herein, the following terms shall have the following meanings;. "Customer" shall mean "Company Name". "Developers" shall mean "Company Name". "Presentation" shall mean the project according to the terms and specifications as set out in the schedules to this contract as agreed and amended by the parties hereto. "Specifications" shall mean for the purpose of each separate contract the specifications as set out and agreed to by the parties, and any amendments thereto, as attached hereto as Schedule B. "Dollars" All amounts referenced herein shall mean currency of Canada. "Material" shall mean all of Developer's and third parties' material described in Schedule C.
Schedule A - Terms and other conditions for the development of the Presentation. Schedule B - Specifications that are applicable to Customer's Presentation. Schedule C - List of Material owned by Developer and third parties. Developers agree to develop the Presentation according to the terms and specifications set forth in Schedule B attached hereto. Developers agree to develop the Presentation pursuant to the specifications set forth in Schedule B attached hereto (the "Specifications"). Developers will use reasonable diligence in the development of the Presentation and endeavour to deliver to Customer a Presentation based on the Specifications no later than 60 days after all required media has been received from Customer. Customer acknowledges, however, that this delivery deadline, and the other milestones listed in Schedule B are estimates, and are not required delivery dates. Developers shall hold all right, title, and interest in and to the Presentation. Specifically, but without limitation, Developer shall hold all right, title, and interest in and to (1) all text, graphics, animation, audio components, and digital components of the Presentation (the "Content"), (2) all interfaces, navigational devices, menus, menu structures or arrangements, icons, help and other operational instructions, and all other components of any source or object computer code that comprises the Presentation, (3) all literal and nonliteral expressions of ideas that operate, cause, create, direct, manipulate, access, or otherwise affect the Content, and (4) all copyrights, patents, trade secrets, and other intellectual or industrial property rights in the Presentation or any component or characteristic thereof. Customer shall not do anything that may infringe upon or in any way undermine or challenge any of Developers' right, title, and interest in the Presentation, as described in this paragraph 4. Notwithstanding the above, Customer shall retain all of its intellectual property rights in any text, images or other components it owns and provides to Developers for use in the Presentation. For all of Developers' services under this Agreement, Customer shall compensate Developers, in cash, pursuant to the terms of Schedule A attached hereto. In the event Customer fails to make any of the payments referenced in Schedule A by the deadline set forth in Schedule A, Developers have the right, but are not obligated, to pursue any or all of the following remedies: (1) terminate the Agreement, (2) remove all web sites, hosting and tracking resources for Presentation, (3) avail itself of any other right available at law, equity or otherwise bring legal action, (4) keep Customer's deposit and credit it towards development time and costs already incurred for the Presentation. The rights and remedies set out in this Agreement are cumulative, and the exercise of any right shall not exhaust all rights or preclude Developers from exercising any one or more right or remedy. Customer and Developers acknowledge and agree that the Specifications and all other documents and information related to the development of the Presentation provided by Developers (the "Confidential Information") are confidential and constitute valuable trade secrets of Developers. Customer shall keep the Confidential Information in confidence and shall not, at any time during or after the term of this Agreement, without Developers' prior written consent, disclose or otherwise make available to anyone, either directly or indirectly, all or any part of the Confidential Information. Excluded from the "Confidential Information" definition is anything that can be seen by the public on the Presentation when each page of the Presentation is first accessed. Developers warrant the Presentation will conform to the Specifications for a period of 30 days from the date of shipment by Developers. If the Presentation does not materially conform to the Specifications, Developers shall be responsible to correct the Presentation without unreasonable delay, at Developers sole expense and without charge to Customer, to bring the Presentation into material conformance with the Specifications. This warranty shall be the exclusive warranty available to Customer. Except as expressly set out herein, Customer waives any other warranty, condition or representation, express or implied. Customer acknowledges that Developers do not warrant that the Presentation will work on all platforms. Customer acknowledges that Developers are not responsible for the results obtained by Customer on the Presentation. Customer acknowledges that Developers are not responsible for fixing problems on Presentations, once mass produced after Customer has tested, proofed and approved their Presentation. Under no circumstances will Developers be liable to Customer for any claim for damages, direct, indirect, incidental, consequential or special howsoever caused or arising, even if such damages are reasonably foreseeable. Customer agrees that its sole and exclusive remedy for damages (either in contract or tort) is the return of the consideration paid to Developers as set forth in Schedule A attached hereto. Developers are retained as independent contractors. Developers will be fully responsible for payment of their own income taxes on all compensation earned under this Agreement. Customer will not withhold or pay any income tax, pension or Workers' Compensation Board assessments, contributions or any other similar charges in respect of Developers' personnel or any other payroll taxes on Developers' behalf. Developers understand that they will not be entitled to any employee benefits that Customer provides for its employees generally or to any statutory employment benefits, including without limitation worker's compensation or unemployment insurance. This Agreement shall be governed by and construed in accordance with the laws of the Province of State and applicable federal laws of Canada, without reference to its principles of conflicts laws. The parties hereby agree to attorn to the exclusive jurisdiction of the courts of the Province of State for the commencement of any action hereunder, other than applications for injunctive relief. This Agreement shall be binding upon and enure to the benefit of Customer and Developers and their respective successors and assigns, provided that Developers may not assign any of their obligations under this Agreement without Customer's prior written consent. Developers may use some of their own photographs and other media for the Presentation. Developers retain all right, title and interest in such photographs and other media, other than hereby granting Customer a non-exclusive right to use those photographs and media, and only on the Presentation. Customer's right to use of Materials will be revoked if the Agreement is breached. Customer has no right to assign, sell, modify or otherwise alter the Presentation, except upon the express written advance approval of Developers, which consent can be withheld for any reason. Customer warrants that everything it provides Developers to put on the Presentation is legally owned or licensed to Customer. Customer agrees to indemnify and hold Developers harmless from any and all claims brought by any third party relating to any aspect of the Presentation, including, but without limitation, any and all demands, liabilities, losses, costs and claims including attorney's fees arising out of injury caused by Customer's products/services, material supplied by Customer, copyright infringement, and defective products sold via the Presentation. Customer grants Developers the right to use the Presentation for promotional purposes including public display, inclusion in Developers' marketing material and programs and/or to cross-link it with other marketing venues developed by Developers now or in the future. Developers have no responsibility for any third party copying, reverse engineering or improper use of any or all of the Presentation. Developers have the exclusive rights in making any derivative works or modifications of the Presentation, source code or other methods or practices developed and employed by Developers. Customer agrees that Developers' trademarks, logos and web links will be placed, and remain, on the credits page of the Presentation. Customer also agrees to put Developers' copyright notices on the Presentation and the relevant content therein, and maintain such proprietary notices at all times. Including Hardware or Software Compatibility Issues or User Behaviour. Developers make no representations or warranties whatsoever express or implied, statutory or otherwise, including without limitation fitness of purpose, custom or usage, or merchantability regarding hardware or software compatibility, "Y2K" issues, Operating System compatibility and/or any and all improper use of the Presentation by an end-user, individual or other third party. In the event Developers are unable to continue maintenance of the Presentation, non-exclusive rights to the object code version of the Presentation will be granted to Customer. Transfer of Rights does not apply to non-transferable third party licenses and proprietary Material owned by Developers. Customer must use Developers to replicate or copy any additional Presentations produced on CD-ROM or other Digital Format (DVD, PAL, Video or otherwise). Customer may not replicate or copy any of the multimedia or artwork owned by Developers without the express written permission of Developers. Customer agrees there may be differences in printed and screen proofs of artwork and screened artwork on final mass duplicated CD-ROMs. Customer may not decompile, deconstruct or otherwise reverse engineer the Presentation, whether in whole or in part, without Developers' prior approval. A final proof will be provided to Customer prior to mass production or replication and or release of the Presentation and identified to Customer as such. Customer assumes full responsibility to make sure that the final proof is correct in all capacities, including, but not limited to: grammar, spelling, information, content, artwork, copyright and functionality. Developers shall not be held responsible for errors and omissions. Developers shall only be responsible for maintaining backups, copies or other versions of any source or master files, whether developed by Developers or not, for a period of one year from the date of this agreement. Customer agrees to hold Developers harmless from any damage, loss of data, theft or other event that may occur to any photographs, source code, master or other digital files, digital media, print outs, documents or other Customer-owned material given to Developers during the course of this agreement. Customer may arrange, in writing, for Developers' copies to be maintained in escrow in the event Developers go out of business, cannot maintain copies of source or master files, or as otherwise required by Customer. Any externally linked services provided by Developers that the CD-ROM may require, including but not limited to: tracking features, email hosting, forwarding, autoresponders, submission forms and general web hosting, will expire one year from the date of this agreement. External services related to CD-ROMs and Presentations created by Developers are not guaranteed to be fully functional in areas requiring access to Internet services after this date and may require an updated version be created at extra cost for updates and reduplication. Developers are not liable or responsible at any time for any damages resulting from any third party services the CD-ROM or Presentation may use, or changes made to externally linked services that are not provided directly by Developers. Developers will make every effort to test any third party or externally linked resources that Customer requires, and will present to Customer proof that all externally linked services are present and in working condition prior to signoff and replication. Developers are not responsible for maintaining any of the data, features or reports that third party services may provide. The complete CD-ROM Development Contract (Canada) - with the actual formatting and layout - is available in this Contract Pack.